This No.1 DVD ripper provides an easy way to convert DVD to mobiles & pads for all Windows 8/10 users without limitation! Why You Need a DVD Ripper for Windows 8 Devices? 4. Have further management on ripped video files to meet personal needs such as air stream via WiFi network. 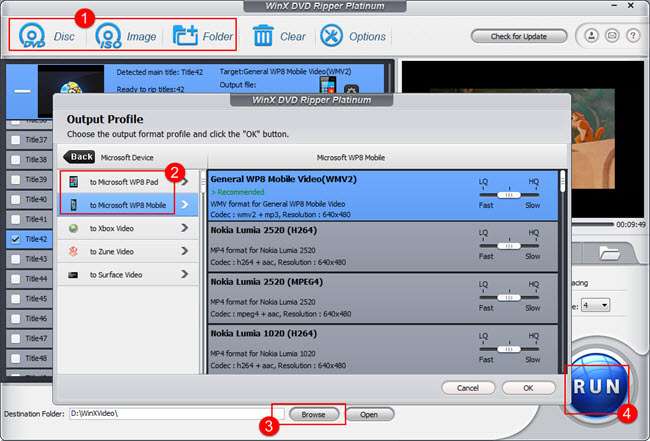 WinX DVD Ripper Platinum is a perfect DVD video entrainment Windows software that provides an easy way to play DVD movie with all Windows media players and on all common tablets & mobiles from Microsoft, Apple, Android, Sony and others without worry about format limitation by ripping DVD to PC as various video formats such as rip DVD to AVI, DVD to MPEG4, H264, MOV, FLV, WMV, M2TS, TS, etc. This DVD ripper is tested as No.1 fast DVD ripper software in the market. It also delivers high quality result with original video and audio. With this software, you can also make a digital backup of your DVD. For instance, clone DVD Disc to ISO image, copy DVD title to MPEG2, back up main content of a DVD to save on PC and play it without DVD disc. WinX DVD Ripper Platinum is also a good DVD to Windows 8 mobiles & pads ripper for Windows 8 users to convert DVD to video formats playable on Windows 8 devices such as Nokia Lumia 2520/1020/920/820, Samsung Ativ S/Tab, Acer Aspire S7 11/ Iconia Tab, Asus, Lenovo ThinkPad, etc. You do not worry about the video formats limitation and network connection. How to Convert DVD to Windows 8 Devices with WinX DVD Ripper Platinum? Beforehand you can free download WinX DVD Ripper Platinum if you have not tried this software before. Then install this DVD to Windows 8 mobiles & pads ripper following wizard and double-click software icon to launch it on computer. Step 1: Click "DVD Disc" to import inserted DVD. From the user interface, you can see that this DVD ripper also supports ripping DVD ISO Image and DVD folder. Step 2: Select output format. For instance, to convert DVD to Nokia Lumia 2520, you can simply choose "Microsoft Device" -> "Microsoft WP8 Mobile" -> "Nokia Lumia 2520 (H264 or MPEG4)". Then click "OK" button. In this step, you can choose any other supported Windows 8 mobile & pad type as well. Step 3: Click "Browse" to define the output file saving folder. Step 4: Hit "Run" button to start DVD conversion. All you need to do is transferring the converted DVD video to Windows 8 mobiles or pads for later playback. • Select destination folder for converted DVD video by hitting "Browse" button. • Click "CPU Core Use" to choose CPU core according to the core of CPU. This DVD ripper can support up to 8 cores. • Select two or more titles and combine them to one by clicking "Merge File". • Click "Edit" to crop video size or clip video segments. • Preview DVD movies before ripping DVD. • Click "Option" to adjust video and audio parameters. • Extract music from DVD by choosing "to Music" as output formats. It supports MP3, AAC, AC3 music formats.